Udemy - The Bootstrap 4 Bootcamp | Free eBooks Download - EBOOKEE! Posted on 2019-02-24, by elegance. Bootstrap is currently the single most used library on all of Github, beating out other tools like React and Angular! It's immensely popular, and with good reason: it makes creating responsive websites a breeze. This course will take you from a complete beginner to a Bootstrap 4 expert in a matter of hours! Or, if you already know Bootstrap 3, this course will serve a complete guide to all the new changes and improvements in Bootstrap 4. By the time we're done, you'll master every single component, the powerful grid system, and the brand-new utility classes. By then end of the course we'll be building complete, responsive websites that looks great on all devices. We'll learn to write and compile SASS to customize our own version of Bootstrap. In addition, since Bootstrap 4 is now built on top of Flexbox, we spend a lot of time learning the ins and outs of Flexbox along the way! Most Bootstrap courses follow a similar pattern: "Watch me code. Watch me do x. Watch me do y". There's never a chance for you to actually practice what you're watching. This course is different. Every section contains at least one exercise, activity, or quiz to get you practicing ASAP. Sometimes I show you mockups and you to re-create the layout on your own. Other times, I give you deliberately broken code and ask you to fix it. All the activities are based on my experience teaching bootstrap in classroom and are designed to keep you engaged and learning ???? I've put a ton of work into making this course the best Bootstrap course out there. Watch a preview video or sign up and see why Bootstrap is currently the most popular front-end library around. 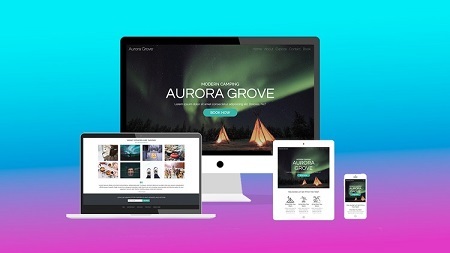 It makes developing good-looking websites incredibly easy (and kind of fun!). No comments for "Udemy - The Bootstrap 4 Bootcamp".